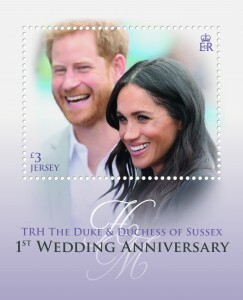 Six stamps and a Miniature Sheet will be issued by Jersey Post on 2 May 2019 to celebrate the first wedding anniversary of Their Royal Highnesses The Duke and Duchess of Sussex. Designed by Up Studio, the stamps feature photographs taken at notable events during the Royal Couple’s first year of marriage. The marriage of Prince Henry of Wales to Ms Meghan Markle took place on 19 May 2018 at St George’s Chapel in Windsor Castle. Hundreds of thousands of well-wishers greeted the newly married couple as they left the Chapel and embarked on their journey together. On their wedding day, Queen Elizabeth II conferred a Dukedom on Prince Henry of Wales and his titles became Duke of Sussex, Earl of Dumbarton and Baron Kilkeel. Prince Harry therefore became His Royal Highness The Duke of Sussex and, upon marriage, Meghan became Her Royal Highness The Duchess of Sussex. 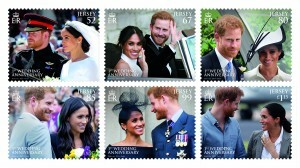 The six stamps feature photographs of the Royal couple: leaving St George’s Chapel following their wedding ceremony, making their way to their evening wedding celebrations in an E-Type Jaguar, at the first day of Royal Ascot, talking to well-wishers during a visit to Croke Park in Dublin, on the balcony of Buckingham Palace watching the flypast to mark the centenary of the Royal Air Force and arriving at Dubbo Airport, Australia on their first major Royal tour together. The Miniature Sheet features a photograph of The Duke and Duchess of Sussex as they watched traditional Gaelic sports being played at Croke Park on the second day of their visit to Dublin, Ireland. Jersey Post’s TRH The Duke & Duchess of Sussex – 1st Wedding Anniversary stamps will be available to buy from all branches of Jersey Post from 2 May 2019. Philatelic stamp products such as Miniature Sheets, Souvenir Sheetlets, First Day Covers and Presentation Packs will be available from the Jersey post offices at Broad Street, St Helier and Rue Des Pres, St Saviour on issue day and can be ordered now at www.jerseystamps.com Alternatively, you can email the Jersey Philatelic Bureau at stamps@jerseypost.com or telephone us on: +44(0) 1534 616717.